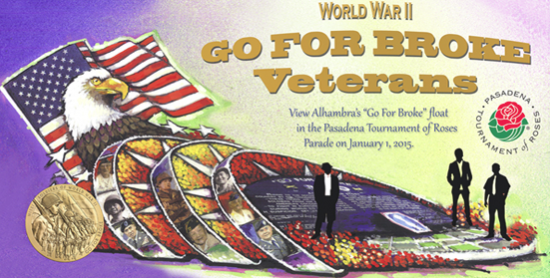 ALHAMBRA — The City of Alhambra announced that it is responding to the 2015 Rose Parade theme of “Inspiring Stories” with a float honoring the Japanese American soldiers of World War II who served in segregated units in Europe and the Pacific. Go For Broke National Education Center (GFBNEC) is providing historical perspective and organizing the nationwide search for seven veterans to ride the float on New Year’s Day. The inspiration for the vertical feature of the float is the Go For Broke Monument in downtown Los Angeles with its iconic semi-circular design. Along the outside of the semi-circles are images of the 21 Nisei recipients of the Medal of Honor from World War II. A large American flag with a bald eagle rise above the semi-circle and the Congressional Gold Medal awarded in 2011 to the Japanese American units is featured prominently near the base of the flag. The float design calls for seven veterans from the 100th Infantry Battalion (Separate), 442nd Regimental Combat Team and Military Intelligence Service to ride on the float to represent their units. * Must be present in Pasadena for the final float judging on Dec. 31 at 2 p.m. This is a once-in-a-lifetime opportunity and GFBNEC is encouraging families to nominate their veteran. There is no fee and the City of Alhambra is hoping for representation from across the country. Be advised that transportation and lodging costs are the responsibility of the rider and/or his family. The City of Alhambra Rose Parade Committee is responsible for selecting the float riders. To nominate a veteran, submit a 100-200 word profile. Nominations must be received by Oct. 27. Email the nomination and explanation to Peggy Renke at [email protected], or mail to GFBNEC, 367 Van Ness Way, Suite 611, Torrance, CA 90501.